Every year our income tax law changes. To accommodate such changes, a handful of books are published to help students to prepare for their exam. In this article we have listed 3 best income tax books for CA IPCC or PCC students to start preparing for exams. These books are specifically made for CA IPCC or PCC students to cover new laws for their exam and offer valuable tips for tax planning. Even a B Com student who wants to do professional courses in future can refer it. 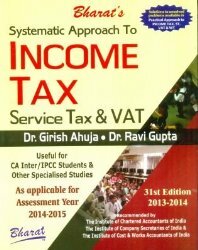 Systematic Approach to Income Tax, ST and VAT is a well organized and easy to learn book written by CA. Girish Ahuja and Dr. Ravi Gupta and published by Bharat Law House. Each unit has been explained with examples and practical questions to make students understand the application of tax laws better. You will also find selected problems from the examinations of ICAI. 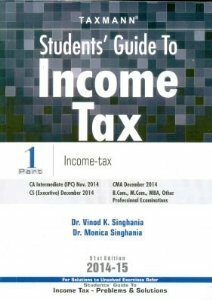 Students Guide to IT Including ST, Vat is written by Dr. Vinod K Singhania and Dr. Monica Singhania. This is a very old book with lots of updates and past exam questions with solutions. Initially you may find it little difficult to understand but once you are used to the language and content of the book it will be very interesting to read. 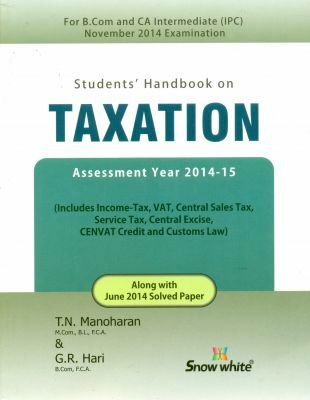 Students’ Hand Book on INCOME-TAX, VAT AND ST is written by T N Manoharan and G R Hari. The book is very user friendly and provides information in a concise manner to save valuable time of readers. This is another book which we recommend each CA IPCC or PCC students to read. Book Publishers Amount in Rs. All these books are recommended by ICAI and covers income tax, service tax and VAT as applicable to CA PCC or IPCC students. Before buying any of these books we recommend you to look for the assessment year printed on the book otherwise you may end up buying for another assessment year which will not be applicable to your CA IPCC exam. All these books have their CA final version specifically written for CA final students. If you refer and choose the right book for CA IPCC then in future it will be easy for you to read same author’s CA final book. Can l buy these books online? Does any book applicable for 2016 May exam is available?